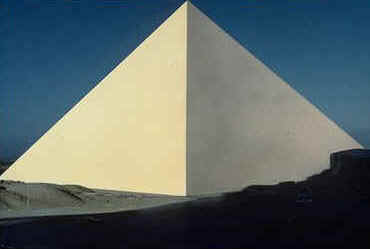 The main body of the pyramid was constructed of 2-ton blocks of yellow limestone, covered by a white limestone casing, which gave the Pyramid a smooth, polished exterior. During the last 1,000 years, however, vandals have removed most of the casing stones. Inside, the Pyramid has a system of passages and chambers, carefully constructed of polished white limestone and red granite. No inscriptions or mummy was ever found within the Great Pyramid. In sheer mass, the Great Pyramid dwarfs all other buildings in the world. 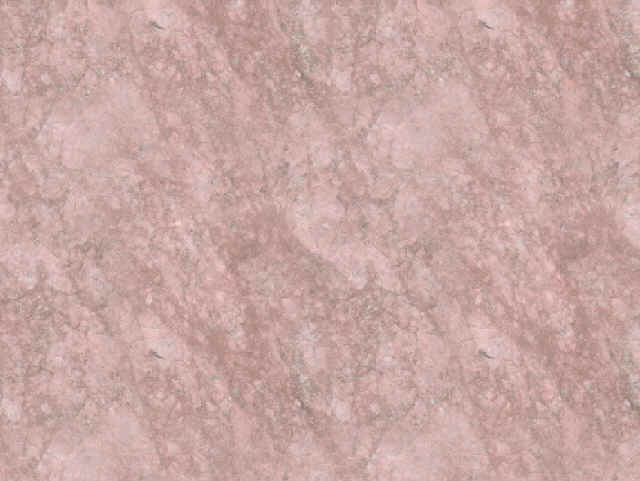 Its ninety million cubic feet of solid rock weighs 6,840,000 tons! 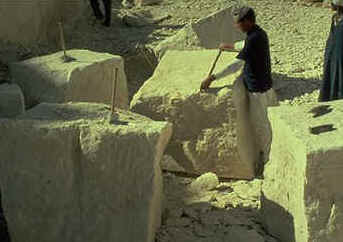 That is enough stone to build a sidewalk 3 inches thick and 2 feet wide around the world! 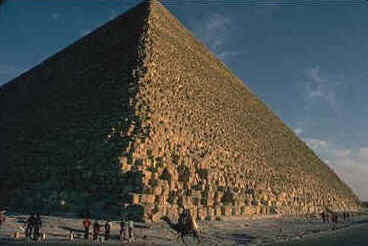 The number and weight of the Great Pyramid's stones would be comparable to a pile of 3,000,000 cars! The Great Pyramid is as tall as a 40-story building. 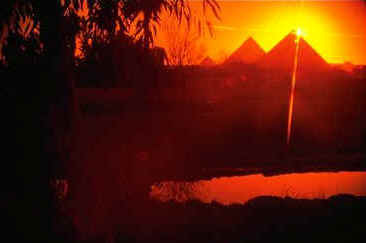 The circuit of the Great Pyramid's base is over 1/2 miles. Architects and builders in every age have been amazed at the precision work of the ancient artisans. 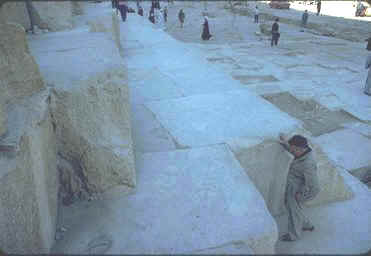 The interior casing stones, some of them weighing 50 tons, were cut to an accuracy within 1/50 of an inch. 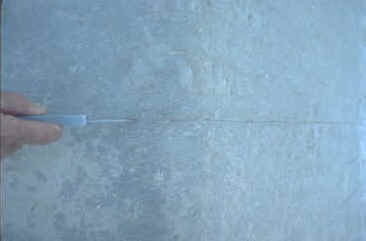 The joints between stones can scarcely be detected with the naked eye. The mortar between the stones was so strong that after thousands of years, the stones shattered before the cement would yield. Not only does the Great pyramid face north, but the entrance passage is a polar star pointer. 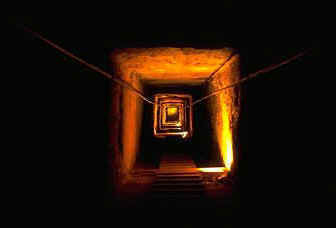 The long, narrow tunnel of the descending passage is like an observatory which points straight to the North Star. The walls of that tunnel are aligned to within 1/50 of an inch over a distance of 150 feet. 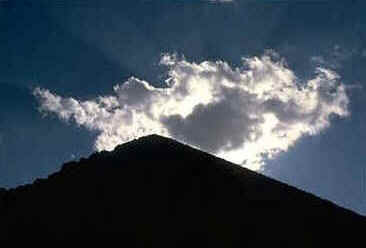 At noonday the pinnacle of the Pyramid points to the sun. Does the height of the Pyramid give us a clue to the distance to the sun? A person climbing the Pyramid would find that for every 10 feet of progress toward the middle of the Pyramid, he would have climbed 9 feet toward the top. This suggests a number: 10~9. 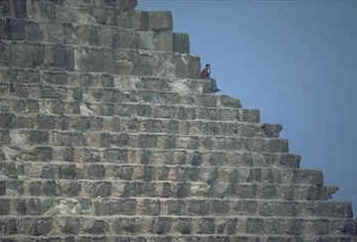 Multiplying the total height of the Pyramid by 10~9, the answer is found to be 91,840,000 miles. 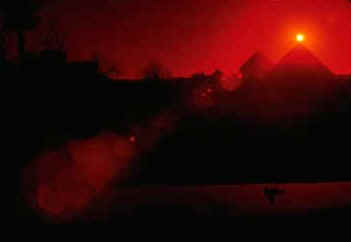 That is exactly 1,000 million Pyramids would reach to the sun! The length of the Pyramid's base side is 761 feet. What is it in the Pyramid measure? It is 365.242 pyramids cubits -- precisely the number of days in a year! If we were to stretch a line around the base of the Pyramid, and then measure it, what would its length tell us? The number of pyramid inches in that line would be exactly the number of days in one century! What is true north? 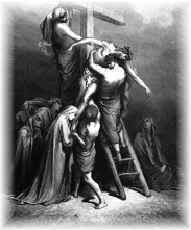 That is not as easy a question as it might seem. A modern magnetic compass is usually off by 3 to 4 degrees. 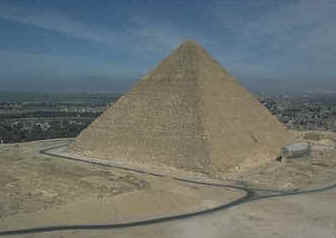 But the builders of the Great Pyramid found true North to within less than 0o5' of arc! This accuracy has never been equaled in any building to the present day. "The squaring of the circle"
...has been one of man's most difficult mathematical challenges. Yet the Great Pyramid by its proportions is a physical solution to that problem. 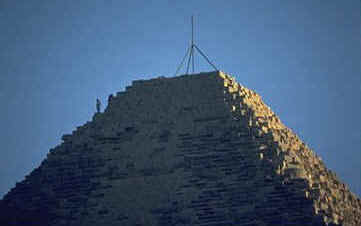 Twice the height of the pyramid, divided by the distance around the base equals "pi" [representing the number 3.14159]. Also, the area of the Great Pyramid's base equals "pi" times the height of the pyramid squared. The Pyramid is accurate in these proportions to within one part in 10,000. Such accuracy in computing the "pi" proportion was not rediscovered until the 6th century A.D. -- more than 2,500 years after the Pyramid's construction! The Great Pyramid's peculiar passage angle (26o18'9.7") tells its location more accurately than can a surveyor's sextant. An imaginary line extending from the Pyramid's entrance passage, out into space, would cross the earth's axis of rotation at a distance precisely 7 earth diameters away from the center of the earth. If the Pyramid were built even 100 feet away from its site, or if the passage angle were minutely different, or if the earth were a fraction larger or smaller -- this remarkable property would be lost! The world's standard of measure is the meter -- supposedly one 10-millionth of the curved line along the earth's surface from the North pole to the equator. Sir John Herschel, a leading British astronomer in the early 1800's, suggested that a better standard would be the one 10-millionth of the earth's half axis -- the straight line from the pole to the center of the earth. 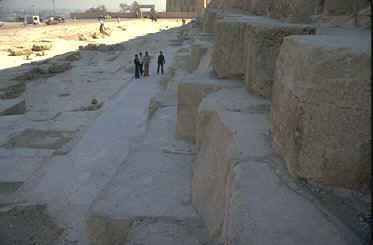 Unknown to Herschel, this distance had been the measuring rod of the Great Pyramid 4,000 years before!